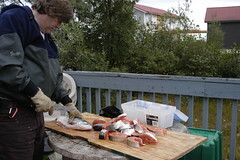 We just put up 110 lbs of coho salmon for the winter. It feels good to have these in the freezer. The fish is fabulous here. We broiled a big salmon on Sunday and we are now enjoying salmon salad sandwiches. Had salmon hot dish last night. Please email with any good salmon recipes. Sure! 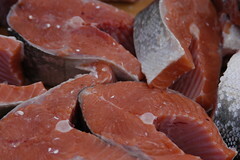 You have to rub in the fresh salmon!! I guess I’ll have to get some of my stash out of the freezer in honor of you and Tom!! Al is heading back to Canada to fish this weekend!! I started a new job at the Delta Diner–I’m the Blue Plate Special cook!! Hopefully, I’ll master all 9 recipes soon! Just in time for the menu to change!! I still miss you!! Mary is dropping out of book club. Sounds like her schedule is really busy! We’re down to 4! Sad really! I still get a few days at the clinic now and again. We’re still in drought here. No berries….did enjoy seeing your blueberries! You should try some in sourdough pancakes!!! Yummy!!! Trees are starting to turn to their fall colors….no doubt the drought has something to do with it. I’m ready for cooler weather and am expecting an early snowfall. Just had a hummingbird check me out at the window! How fun!! I enjoy reading about your teaching position! Send along some of your new Yu’pik words….I don’t think I spelled that right! We can all learn along with you! Wouldn’t speaking native Alaskan at the Black Cat freak out the locals????!!!! :) Hi to Tom! !